This page is the reservation request form for Kobe Steak Ishida, in Kobe, Japan. 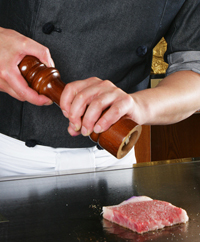 At Kobe Steak Ishida, we provide customers with the highest quality Kobe beef and ingredients. All locations provide counter seating where guests can enjoy the same finest-quality Kobe beef and style of cooking, where expert chefs grill the meat to perfection right before guests. Please note that due to a high volume of reservations and limited seating availability, after receiving your request for a reservation, one of the locations will be selected for you based on availability where we can help you secure a reservation. We kindly request that customers secure a reservation by paying for their course with a credit card or PayPal before their reservation. We look forward to serving you at our restaurant, and making your time at our restaurant, a special one. ※Please choose a course below for each person in the reservation. After you have selected the courses for each person, the total amount of people for the reservation will automatically be calculated. ※All four locations are located very close to each other and have counter seating in front of chefs that will cook your food on a grill in front of you. After receiving your request for a reservation, one of the locations will be selected for you based on seating availability. ※Changes to the reservation date, time, course, number of people, as well as any food requests, are required to be made at least 3 days before the reservation. ※Changes to the reservation date, time, course, number of people, as well as any food requests, are required to be made at least 7 days before the reservation. ※Please do not be late for your reservation. Please note that if you are more than 15 minutes late, then there is a possibility your reservation may be cancelled and you will have to wait for a seat (along with customers that have no reservation and are waiting for a seat). Please note that if you are very late (30 or minutes more late), your reservation will be cancelled and you will be ineligible for a refund or change to a different date or time. The restaurant may be unable to provide you with a meal due to time constraints.